Imagine it! Feeling more deeply at home in your own skin, having more ease in your life, and new confidence to be more your self! InterPlay is a philosophy and practice that builds artistic skill, self-information, leadership ability and community. 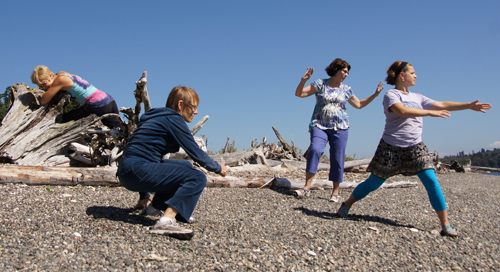 InterPlay uses word, movement and voice to tap into our creative selves. It’s a practice based in an ethic of PLAY. Playing allows for nurturing curiosity and trusting that whatever emerges in the moment is ‘just right.’ When we create this way, we are playfully reminded of our vulnerability as well as our choices as enspirited beings to ‘show up’ for ourselves and others, affirming and celebrating being human. The Secrets of InterPlay is a three-day retreat (September 19 – 22) which introduces the system of InterPlay and its play forms. This retreat is a required component of the Life Practice Program (Beginning in October, 2013 in Seattle), but you can just do SECRETS as a stand alone retreat. Categories: Events, Everything else, Life Practice Program, Play, and Workshops & Retreats. 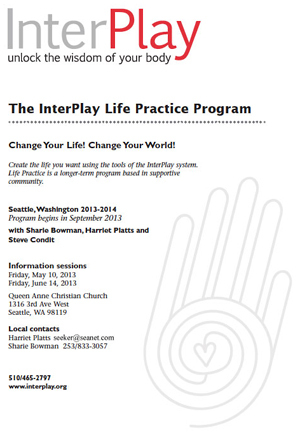 My practice in nurturing relationships and spaces for curiosity, play, and reflection, is evolving to include being part of the upcoming InterPlay Life Practice Program teaching team here in Seattle! I would love to speak with you about your interest! The next Life Practice Program Information session is on Friday, June 14th, at 6:30, Queen Anne Christian Church, Seattle, WA. You may download a complete brochure here. Categories: Events, Life Practice Program, and Play. Tags: creative inquiry, Interplay, life practice, play, transition, and workshops. I’m in the “collecting ingredients for a stew” mode. When I begin a process of designing for an event like a retreat, I listen to ‘what’s up,’ for me, what I’m curious about, what lands on my desk top – web frequency, what emerges from the meditation cushion, and of course the dream scape. It’s all fair game for the stew. After my sit this morning, I began playing my shruti box (a drone sound) and singing/vocalizing aloud through a litany of phrases and words to get at the bottom of this place of discontent I’ve been feeling for several weeks. This state of mind – heart – body, i.e. confusion, fatigue, irritability, cynicism, manifests impatience, more fatigue, discouragement, criticalness of self and others. NOT a pretty place to live. VERY unhappy place in fact. I kept singing about what I thought I was unhappy about, and then it occurred to me. This is doubt! This is what doubt is. It’s insidious in that I never quite know when it starts. It can lurk around for days, weeks, and I do my adapting thing of ‘explaining’ to myself and others, what’s up, when it’s really just about doubt. Self doubt. As I spoke that truth, my heart began to soften with the fatigue that goes with this state in my mind/ bodyspirit. The tears flowed. Beginning to clear….Phew! So as I continue to listen and bring my own voice and the voices of others to the ‘design field,’ I’m circling with women who are writing about spiritual development of women, my own experience of “timing” in life, May Sarton, Annie Dillard, “Mystic Tech,” what does nature have to say about soul – timing, economy of energy/resource. WONDERING around…. Categories: Arts/Inquiry-Based Spiritual Care, Noticings, Play, Soul Conservation, and Vocal Inquiry. Recently, on a morning walk through my neighborhood, I found myself within earshot of a lovely interaction. A young family was walking to their car along with their 2.5/3 year old daughter. The child informed her parents, “Baby is in the car.” A brief moment passed, and I heard the mother say with genuine enthusiasm, as she opened the car door, “Hello Baby.” I thought to myself, THAT’s PLAYING along! May not seem like such a big deal at first, but what this mother offered in FOLLOWing the cue, was a great big ‘ole fat gift of affirmation to her child and for herself to let go…and to rest into the opportunity presented to play. Imagine UPPING your ‘playing along’ skills. The ‘over culture’ says that being a leader is all about initiating stuff. The truth is people can’t be leaders if no one is there to follow…to play along…ecstatically…full on! Truthfully, following, can actually be restful, energizing, without being passive. Give it a go! Categories: Harriet's Everyday, Noticings, and Play. Tags: improvise, play, and Rest. On Tuesday, April 9th, we’ll begin a two-week playful exploration of what it means to modulate the dimmer switch on your play factor. Maybe it needs to be turned UP a bit?! Or maybe, you have just the right amount of playing around in your life right now. Just the other day, I was feeling so exhausted from the fullness of life, and it occurred to me to ask, what is the relationship between play and rest? I’ve often felt like to play, I had to feel totally rested, or energized, or inspired in order to engage in play, but in fact, RESTEDNESS – the dynamic state where stress or pressure feels suspended for just a moment, can actually be a by-product of play. Resting out from whatever version of PINCH-PRESSURE you feel, allows for one to experience a new sort of peripheral vision throughout the whole body. It’s the experience of possibility, a physical roominess of sort. Please contact University Unitarian Church at 206-525-8400 to register. For church members, it’s $15 for both classes. For friends/non-church members, it’s $30 for both classes. The classes run from 7-9, on April 9th and 16th. Categories: Arts/Inquiry-Based Spiritual Care, Events, Play, and Workshops & Retreats. Tags: events, play, Rest, and workshops.